Now available for purchase and free download at Bokorder.se. Also available at Amazon.com, Amazon.de, Bokus.com, and Adlibris.com. Opuscula. 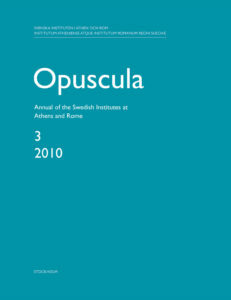 Annual of the Swedish Institutes at Athens and Rome (OpAthRom) 3, Stockholm 2010. ISSN: 2000-0898. ISBN: 978-91-977798-2-1. Softcover, 224 pages.